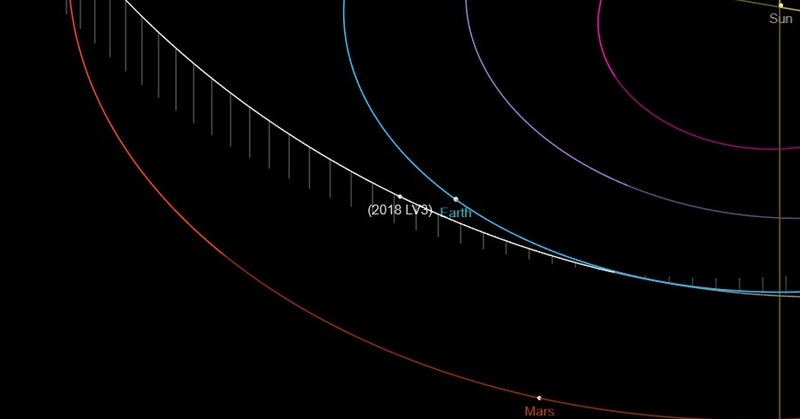 A newly detected truck-sized near-Earth object (NEO), known as 2018 LV3, will pass by the Earth on Friday, June 15 at around 2:30 UTC. The asteroid will miss our planet with a relative velocity of 11.1 km/s at a distance of approximately 0.86 lunar distances (LD), what corresponds to 330,000 kilometers. 2018 LV3 was first spotted on June 11 by the Pan-STARRS 2 (PS2) telescope at the summit of Haleakala on the Hawaiian island of Maui. The Panoramic Survey Telescope and Rapid Response System (Pan-STARRS) is an astronomical survey consisting of astronomical cameras, telescopes and a computing facility, surveying the sky for moving objects on a continual basis. 2018 LV3 is an Apollo-type asteroid with an estimated diameter between 9 and 30 meters. It has an absolute magnitude of 26.5, a semimajor axis of 2.0 AU and orbits the Sun every 2.84 years. Some four hours after the fly-by of Earth, 2018 LV3 will also make close approach to the Moon – passing at a distance of about 1.51 LD (580,000 kilometers). To date, astronomers have discovered more than 18,300 NEOs. Only this month 42 such objects were detected. On June 14, there were almost 2,000 Potentially Hazardous Asteroids (PHAs) detected and none of them is on a collision course with our planet. PHAs are asteroids larger than 330 feet (100 meters) that can come closer to Earth than 19.5 LD.